During the cold winter months, it’s always nice to have a cozy blanket nearby that you can snuggle up with while watching TV or reading. 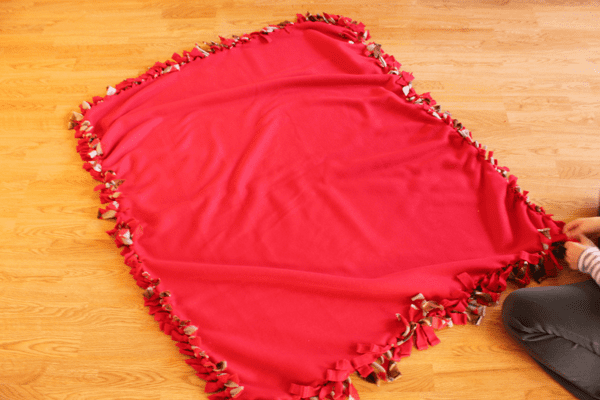 This easy fleece no-sew blanket is just the thing to keep you warm on a cold, snowy day. My kids and I learned how to make these fleece blankets at church. Part of the ministry there is helping people who have gone through disasters like earthquakes, floods or hurricanes and have lost all of their belongings. They need basic necessities like food, toiletry items and quilts or blankets to keep warm at night. One day after volunteering to make blankets at church, my kids decided that they really wanted to make a blanket of their own. Luckily, we found some fun fleece prints at Hobby Lobby that were 40% off, so we decided to buy some fleece and make a couple of blankets for the kids to keep in their rooms. 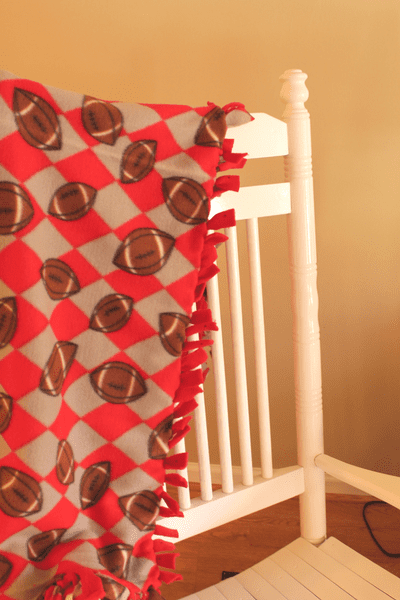 This blanket is so easy to make, because it doesn’t require any sewing…just the ability to tie a double knot! 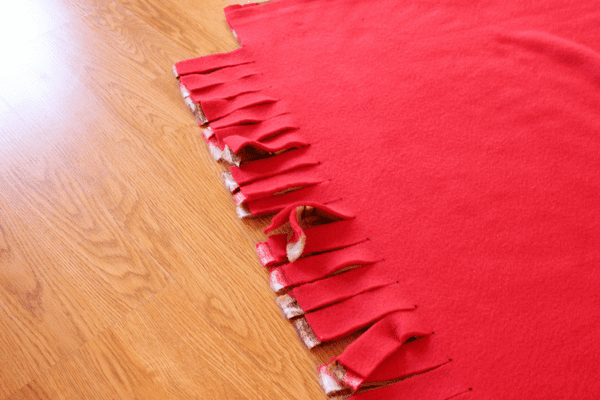 You can also make it any size you like, depending on whether you want it to keep on your bed as a bedspread or just a throw that you can place over the back of a couch or chair. We decided to make blankets that were on the smaller size. 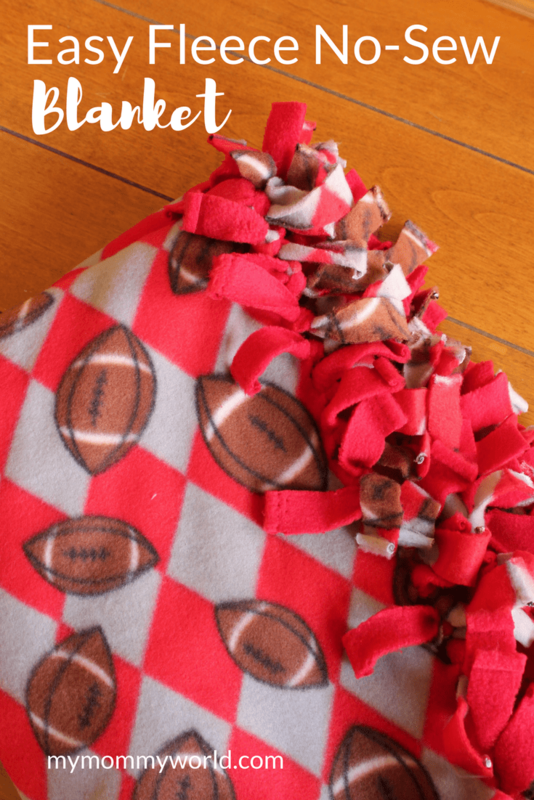 We chose two pieces of coordinating fleece: my son chose a football pattern in red (his favorite color), and a plain red to act as the backing. My daughter chose the cutest owl print and a turquoise fleece for the back. Whichever colors or design you choose, you’ll want two pieces of fleece that measure the same size. Our pieces measured 1 1/4 yards in length. To begin, you’ll want to mark the fleece at 1 inch intervals, about 3 inches from the edge. 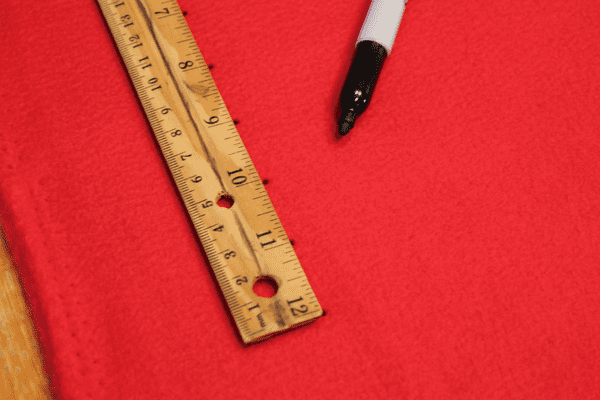 I found that using a ruler and a marker was easiest for us…leaving a dot at every inch made it easy to see where to cut. I didn’t cut off the selvage edge before cutting…you can if you’d like, but I found that it wasn’t very noticeable in the finished product, so I saved myself a bit of work. As you can see from this photo above, when you are done cutting, you’ll have a square at all 4 corners that you’ll need to remove. The next step is cutting into your fabric to the dot, leaving strips in both layers. Cutting through both layers can be tough, so you’ll want to make sure you have some sharp scissors to tackle this step. It might be a good idea to leave the cutting to an adult if your children are small. The next step is one that the kids can definitely help out with! When all the strips are cut, you’ll need to tie the fleece layers together by tying each strip with a double knot. It might seem like a lot of work, but when 2 or 3 of you are working on it at one time, time really goes by quickly, and before you know it, you’re all done! 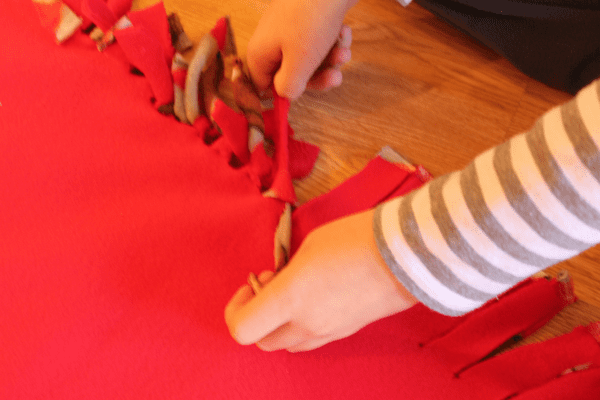 I hope you’ll try making an easy fleece no-sew blanket for your own family soon! My daughter has a fleece no sew blanket we made for her when she was younger. It has held nicely over the years. They are so cozy and warm. I’m so glad to hear that your daughter’s blanket has held up nicely!